Acer is planning to introduce two models called the s50 and s60 in the near future. According to a leaked brochure, they will have hi-res, TFT color screens and Memory Stick slots.The main difference between these two models is the s60 has built-in voice recorder and MP3 playback, while the s50 does not. 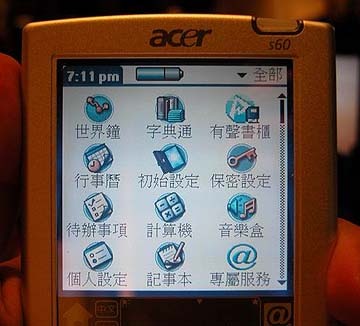 They have a Chinese version of Palm OS 4 but use the hi-res icons from OS 5. According to one site, they will be released in 5 days. The s60 will be about NT$13000 (US$382) and the s50 will cost NT$9900 (US$292). Both models use 33 MHz Dragonball processors. They have 16 MB of RAM and 8 MB of flash ROM. They are 4.7 by 3.0 by .5 inches and weigh 5.5 ounces. Hope Acer will enter the US market. This will give more competition and keep Palm, Handspring and Sony on their toes and keep innovation going. Plays MP3 like the S10, but can also record audio directly into MP3 format. Apparently has an audio e-book reader utility. 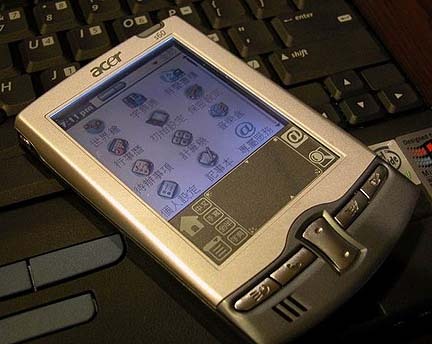 320x320 screen with enhanced Chinese display. Compatible with Palm OS 5 hi-res API. And already using the icons for what appear to be OS 5 as well as the API. hmmm. Are they part of the API? > Are they part of the API? The bitmap icons themselves would be part of each application. The OS 5 hi-density bitmap API would load them instead of the standard ones, assuming it really supports the API. According PalmisLife web site, Acer will introduce two models, s50 and s60. The estimate SRP of s60 will less than NT$13000(US$382) and NT$9900(US$292) for s50. The difference is s50 remove MP3 and voice recorder function. Memory Stick Expansion slot and support Memory Stick IO device like MS camera/MS bluetooth card. I think the guy on south park last night was using one of these acers to build the great wall of south park. Notice that the devices displayed in the brochure do not have additional Chinese characters in their grafiti area. This could be an indication that they plan to release the devices on the US market soon. But it is still not available on the US market. I assume the new devices will have a similar deal then. They make a version of the s10 in English but don't sell in in the U.S. I keep hoping, tho. How much is the S10 in Singapore? Three languages in one device? It's got three languages in one device, and you can switch it any time you want? RE: Three languages in one device? No. You choose the lanuguage when you buy the device. No switching. Follow the link to the brochure in the article. Its a scanned version of an English brochure. The pictures there are clearly for an English device unlike the pictures in the article. In fact, the English version had been selling for nearly half a year before the Chinese OS versions were available, and that was when the English websites started to pick up on the "news". Actually, Traditional Chinese shipped before English in Asia. It is sold in Taiwan in the middle of December last year. Your info is very doubtful. It's the first non-Clie PDA which uses Memory stick. This isn't new. The Acer s10 has had MS slot since last year. Nice device, nice features but another OS4 device??? What's the point of OS5 then if everyone can bring out these features pushing OS4? I'm tired of this confusing transition b/w OS4 and OS5. Why aren't the manufacturers bringing out OS5 devices now or wait a month when we are expecting new OS5 devices? Sorry I'm just confused. Because OS5 runs on ARM-Based chip, so if you want to build a device running OS5, it requires you to use ARM-based chip that is much more expensive. what would an OS5 device have over this one? So tell me this guys. Why even bring OS5 to market then so soon? Appears that everyone can wait till next year. I believe it will be confusing having OS4 and OS5 devices on the market at the same time. I can't imagine the BS that will come from the CompUSA (or similar stores) sales guys. These sales guys know nothing already, now just mix up the palm devices and it's hell for the consumers. I hope they clean up this mess. Shouldn't be a problem. 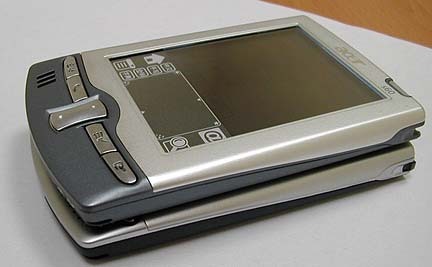 Correctly writted PalmOS applications should run on both OS4.x and OS5 devices. Most (non-media) applications won't require ARMlet code. The OS5 devices will be faster at some things; so it will be like Dell/HP/Gateway introducing a new machine with a speed bump CPU and a faster graphics card while the slower machine get moved to the economy category. Sounds like a good reason to buy an Acer. Somebody said their battery is 900mah. Any idea what the rating of the 505 is? finally some competition for Clie. Plus it has a voice recorder! come on bring it here! I hope we'll see a review of it soon. fact that it's running 33 MHz, and not 66 MHz. I don't care about the ARM-processors and OS 5.x. Heck, they've even included the OS 5.x Hi-res stuff. Looks interesting. So what's the difference between this and the Sony T615/655 (besides that its in Chinese)? s60 can play MP3 at least 8 hours. The voice recorder can record up to 2 128MB MS, which is over 500 minutes, non-stop. I think they can top Sony's low-end models. The only thing that seems really odd is the 8 MB of flash ROM, what is it for? It's for storing hi-res Chinese fonts. It may also contain English-Chinese/Chinese-English dictionary by default, stored in the Flash memory.